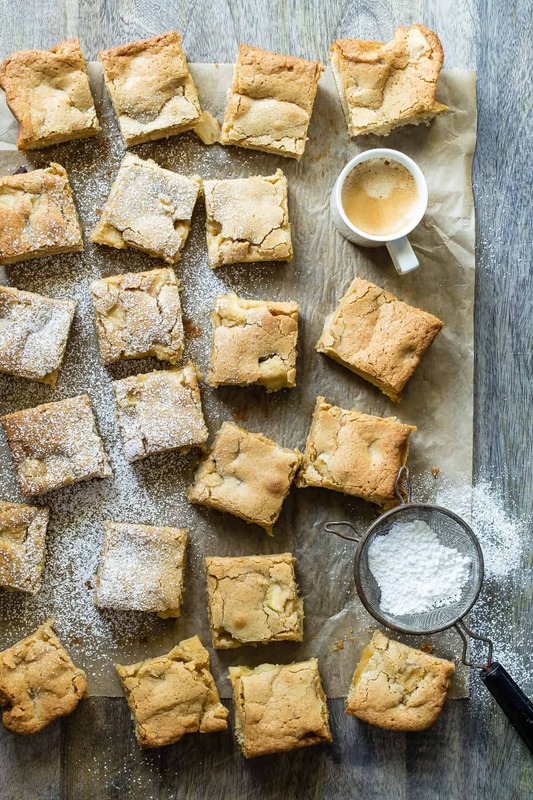 A giant plate of moist Caramel Apple Blondies are just what we all want as a snack, right? 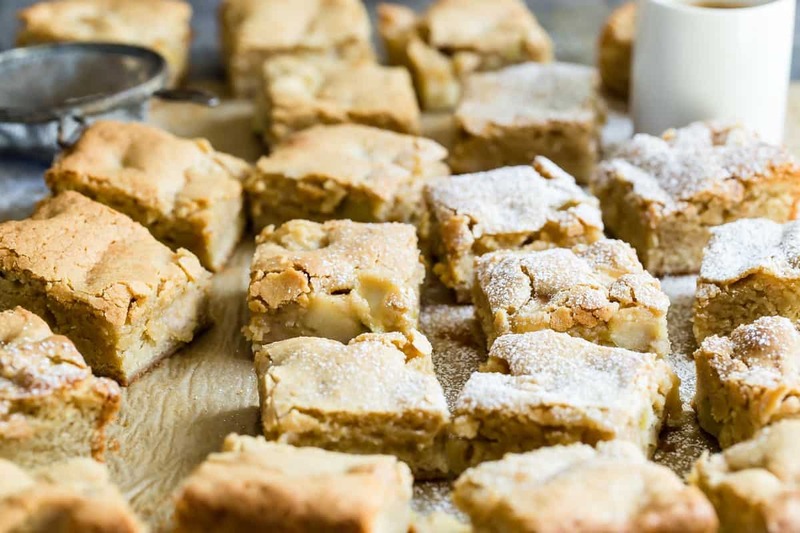 Soft and heavy on the butter with chunks of apples cooked in a caramel sauce, these blondies are your new bee-eff-eff!! Brownies…blondies….brownies? Gahhh, I could go back and forth All. Day. Long. And I still couldn’t give you an answer as to which one is my favorite. Both are so unique in their own way, kinda like my kids. I love them both, for very different reasons. So we’ll just leave my gooey bar dilemma at that. 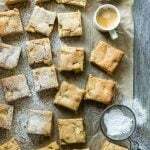 Even these Caramel Apple Blondies can’t help me decide and they’re loaded with chunks of apples cooked in a brown sugar and butter sauce and then folded into the fluffy buttery batter. I’ve been making a lot of pumpkin stuff lately, so it was nice to make something that wasn’t orange but still stay on the fall theme with caramel and apples. I may have peaked on pumpkin too early. Probably not, I love everything pumpkin. No early peaking. 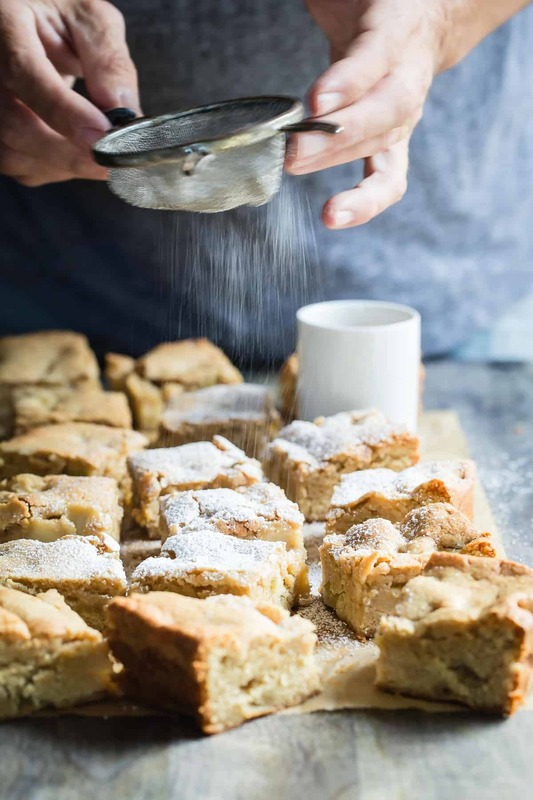 One bite into these crackly topped blondies with the soft brown sugar center might send you straight to the kitchen. I like to eat them with a fresh poured espresso but really, there’s nothing I don’t like to team up with espresso. I like it so much that I even made my all time favorite coffee cake with it. See, here’s the deal. Give me these Caramel Apple Blondies or that coffee cake over any other baked goods. Well, maybe a flaky chocolate croissant would slow my decision but the sweet, cakey texture and crusty top is totally where things are at for me. I wanted to finish these off with a white chocolate drizzle but that can get messy and make things hard to store but hey, if that tickles you then go heavy on the chocolate. Good luck to you, I know you’ll do just fine! In a large pan combine the first 5 ingredients and simmer over a low heat until the butter has melted and stir to combine. Set aside. Preheat the oven to 350 degrees F and line a 9 x 13 baking pan with parchment paper. Using a stand mixer, beat the soft butter until light and creamy. Add the eggs one at a time beating well after each one and scraping down the sides of the mixing bowl. Mix on high until light the batter is light and airy. Pour in the vanilla and mix. Take the bowl off the machine and add the apple mixture and sauce. Using a spatula fold the apples through the batter and then transfer it to the prepared pan. Spread the batter out evenly towards the edges. Place the pan in the oven and bake for 30-35 minutes or until a toothpick inserted comes out clean. 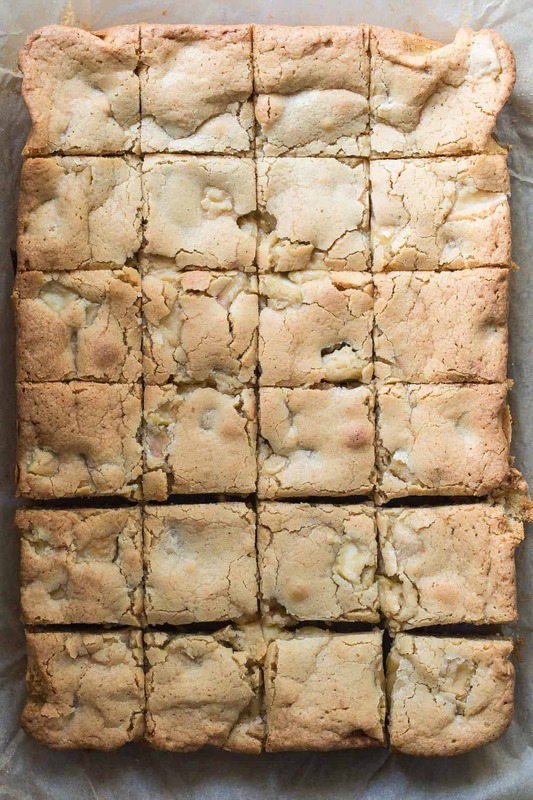 Let the blondies cool before slicing into squares. I can’t wait for apple picking to begin!! Gorgeous!! I like blondies SO much better than brownies..and with caramel apple? YAS. I agree that I’d definitely choose these beauties over most desserts. Absolutely gorgeous! I think I would definitely go for the white chocolate drizzle. It would also be good with milk chocolate drizzle too. Really you can’t go wrong here. Blondies, brownies it’s always a win! Give me all the blondies, these are everything! The texture of these looks just perfect, Gerry! And the chunks of apple inside? I might dare to choose these over an apple pie! I have only more recently become a bigger fan of blondies. I mean, what’s not to like about butter and brown sugar?! Gorgeous ones here, love the apples! !